Having a dog who will charge after the ball can be a lot of fun and is a great way of exercising them. Here are some really key concepts that I run through in training a dog to fetch. The video above which when combined with some patience and a little bit of time will see most dogs happily returning the ball to your feet. This is one of those few times when you are actually trying to get your dog more excited. Usually we are trying to calm our dogs down, however in order to get them to chase the ball you want them to be full of energy. Raise your own energy, run around a bit, raise your voice, get excited and even throw and then chase the ball yourself! Of course if there are some other dogs around who chase the ball then this is a far easier option. The most important thing to stick to is never chase your dog, many dogs are hanging out for you to chase them and you only need to give in a few times for them to start thinking it is a great game. And, if you can’t catch them, then what’s the point in chasing them? To catch your dog once they have got the ball attach a line onto their collar and then use that to encourage them to come towards you. If you are lucky you may not need a line. Either way, the line will be only necessary for a short period of time, however it is vital to prevent a game of chase from starting up. 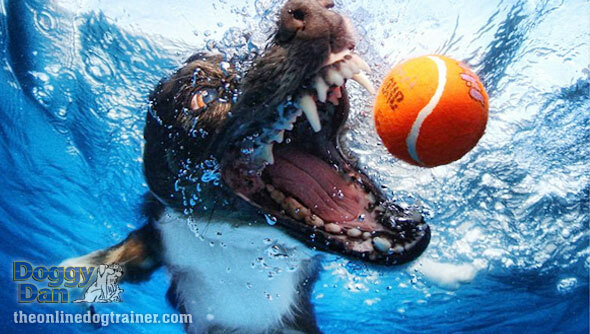 Once you are near enough to your dog give them the most delicious treat in return for the ball. They will soon get the idea that it is a great exchange, the ball for a treat. Especially when you then throw the ball for them again. If your dog is really not interested then remember there are some dogs who are simply not interested in chasing a ball and bringing it back to you knowing that you are going to throw it away again ! Sometimes they may even be one of those breeds who are often associated with loving the ball and chasing… The truth is, with these dogs there is not a lot of point in trying to get them to change their mind, better to find an activity that they do enjoy.